The FCUSA Coastal Cup-Cape Cod is a two day tournament held over Columbus Day weekend for boys & girls teams ages U8-U15. A Friendship Festival format is offered for the U8-U10 teams. A one day, 2 match format for U8 & U9 age groups and a two day, 4 match format (2 Sat. & 2 Sun.) for U10 age group. Multiple competitive flights for U11-U15 teams are offered in a 3 match guarantee format, 2 on Saturday & 1 on Sunday with a possible final Sunday afternoon. 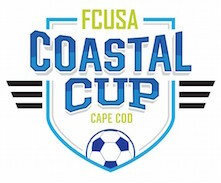 RoomRoster is a presenting sponsor of the FCUSA Coastal Cup on Cape Cod. All teams are required to check-in 1 hour prior to their first match. Only teams playing at 9 AM will be allowed to check-in prior to 8:30 AM. Saturday beginning at 8 AM. Only those teams playing at 9 AM will be allowed to check-in prior to 8:30 AM. Teams are accepted on a rolling basis as they apply and submit payment of the entry fee (credit card, e-check, check or money order with club name, gender & age group). We will not be accepting payment at the event. All entry fees must be received prior to September 26. If not received, teams will be dropped from the schedule. If a team is accepted and later withdraws after September 26, the entry fee will be forfeited. Login using existing GOTSOCCER team account or create a new account, if you don’t have one for the team. Register for the appropriate age group and format you wish to participate in. Birth year will be used to classify teams into the appropriate age group. Please print the the completed application and submit with entry fee if paying by check or money order. You will receive an automatically generated email confirming your application has been submitted. This is not a confirmation of acceptance. This email contains your confirmation number that must be on all entry fee checks.